Krill are small animals, yet mighty in terms of their importance to the food chain. The animal gets its name from the Norwegian word krill, which means "small fry of fish". However, krill are crustaceans and not fish, related to shrimp and lobster. Krill are found in all of the oceans. One species, the Antarctic krill Euphasia superba, is the species with the largest biomass on the planet. According to the World Register of Marine Species, it's estimated there are 379 million tonnes of Antarctic krill. This is more than the mass of all the humans on Earth. Krill are about as long as a person's little finger. Although the Antarctic krill is the most abundant species, it is only one of 85 known species of krill. These species are assigned to one of two families. The Euphausiidae includes 20 genera. The other family is Bentheuphausia, which are krill that live in deep water. 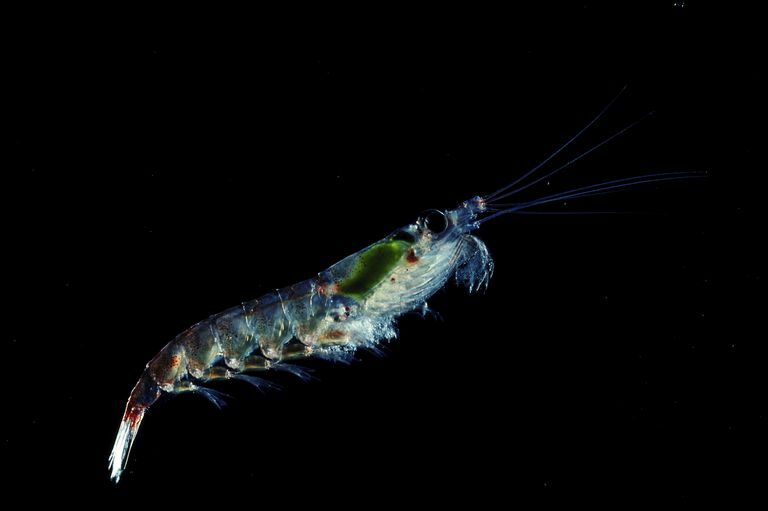 Krill are crustaceans that resemble shrimp. They have large black eyes and translucent bodies. Their chitinous exoskeletons have a reddish-orange tinge and their digestive systems are visible. A krill body consists of three segments or tagmata, although the cephalon (head) and pereion (thorax) are fused to form a cephalothorax. The pleon (tail) has many pairs of legs called thoracopods of pereiopods that are used for feeding and grooming. There are also five pairs of swimming legs that are called swimmerets or pleopods. Krill can be distinguished by other crustaceans by their highly visible gills. An average krill is 1-2 cm (0.4-0.8 in) long as an adult, although some species grow to 6-15 cm (2.4-5.9 in). Most species live 2-6 years, although there are species that live up to 10 years. Except for the species Bentheuphausia amblyops, krill are bioluminescent. The light is emitted by organs called photophores. The function of photophores is unknown, but they may be involved in social interactions or for camouflage. Krill probably acquire luminescent compounds in their diet, which includes bioluminescent dinoflagellates. Krill live in a large group called a swarm. The details of the krill life cycle vary slightly from one species to another. In general, krill hatch from eggs and progress through several larval stages before reaching their adult form. As the larvae grow they replace their exoskeleton or molt. Initially, larvae rely on the egg yolk for food. Once they develop a mouth and digestive system, krill eat phytoplankton, which is found in the photic zone of the ocean (the top, where there is light). The mating season varies depending on species and climate. The male deposits a sperm sack at the female's genital orifice, the thelycum. Females carry thousands of eggs, amounting to as much as a third of their mass. Krill have multiple broods of eggs in a single season. Some species spawn by broadcasting eggs into the water, while in other species the female carries the eggs attached to her within a sac. Krill swim together in enormous groups called swarms. Swarming makes it more difficult for predators to identify individuals, thus protecting the krill. During the course of the day, krill migrate from deeper water during the day toward the surface at night. Some species swarm to the surface for breeding. Dense swarms contain so many krill that they are visible in satellite images. Many predators take advantage of swarms for feeding frenzies. Larval krill are at the mercy of ocean currents, but adults swim at pace of about 2-3 body lengths per second and can escape danger by "lobstering". When krill "lobster" backwards, they can swim more than 10 body lengths per second. Like many cold-blooded animals, the metabolism and thus life span of krill is related to temperature. Species that live in warm subtropical or tropical water may only live six to eight months, while species near the polar regions may live longer than six years. Penguins, whales, and other antarctic animals rely on krill as a primary food source. Krill are filter feeders. They use comb-like appendages called thoracopods to capture plankton, including diatoms, algae, zooplankton, and fish fry. Some krill eat other krill. Most species are omnivorous, although a few are carnivorous. The waste released by krill enriches the water for microorganisms and is an important component of the Earth's carbon cycle. Krill are a key species in the aquatic food chain, converting algae into a form larger animals can absorb by eating the krill. Krill are prey for baleen whales, seals, fish, and penguins. Antarctic krill eat algae that grows beneath the sea ice. While krill may last over a hundred days without food, if there isn't enough ice, they eventually starve. Some scientists estimate Antarctic krill populations have fallen 80% since the 1970s. Part of the decline is almost certainly due to climate change, but other factors include increased commercial fishing and disease. Krill oil contains omega-3 fatty acids. Commercial fishing of krill mainly occurs in the Southern Ocean and off the coast of Japan. Krill are used to make aquarium food, for aquaculture, for fishing bait, for livestock and pet food, and as a nutritional supplement. Krill are eaten as food in Japan, Russia, the Philippines, and Spain. The flavor of krill resembles that of shrimp, although it is somewhat saltier and fishier. It must be peeled to remove the inedible exoskeleton. Krill is an excellent source of protein and omega-3 fatty acids. Although the total biomass of krill is large, the human impact on the species has been growing. There is concern that catch limits are based on inaccurate data. Because krill is a keystone species, the effects of over-fishing could be catastrophic. P. J. Herring; E. A. Widder (2001). "Bioluminescence in Plankton and Nekton". In J. H. Steele; S. A. Thorpe; K. K. Turekian. Encyclopedia of Ocean Science. 1. Academic Press, San Diego. pp. 308–317. R. Piper (2007). Extraordinary Animals: An Encyclopedia of Curious and Unusual Animals. Greenwood Press. Schiermeier, Q (2010). "Ecologists fear Antarctic krill crisis". Nature. 467 (7311): 15. Do you know where to start with Stone Barrington?